Knowledge is power. Read up. Sometimes we’re not ready or able to talk to others about certain things. Below you’ll find a list of print resources—grouped by categories—on a variety of topics from coming out tips to sexual health information to healthy relationships advice. A road map developed by QTIPOC youth, to illustrate which resources and services are needed or lacking in their communities across British Columbia. In January, 2017, the Urban Native Youth Association invited over 50 queer, trans and Two-Spirit youth of colour from across British Columbia to attend a forum in which they could explore and share what services are available, and what is lacking in their communities. QMUNITY helped co-host the forum. Learn more about ways your agency or work can better support people of colour in the LGBTQ2S communities, who often experience intersecting oppressions on the basis of race, gender, sexual orientation and other factors. If you’d like more information on the forum, this poster, Two-Spirit programming and resources, and other programs offered by UNYA, get in touch with them here. How can we foster and hold spaces that are safer for all participants to feel fully engaged and valued? These guidelines are by no means exhaustive, but can be helpful in establishing meetings, focus groups and workshops that are productive, efficient and most importantly, safer for everyone involved. We encourage you to use this resource as a starting point, and to check-in with those in attendance to see what else they need from others in the room to feel like they can participate. QMUNITY has revised and updated community guidelines originally inspired by work out of the California Family Health Council and the Vista Community Clinic. A printable card to encourage and empower everyone to be mindful of language. 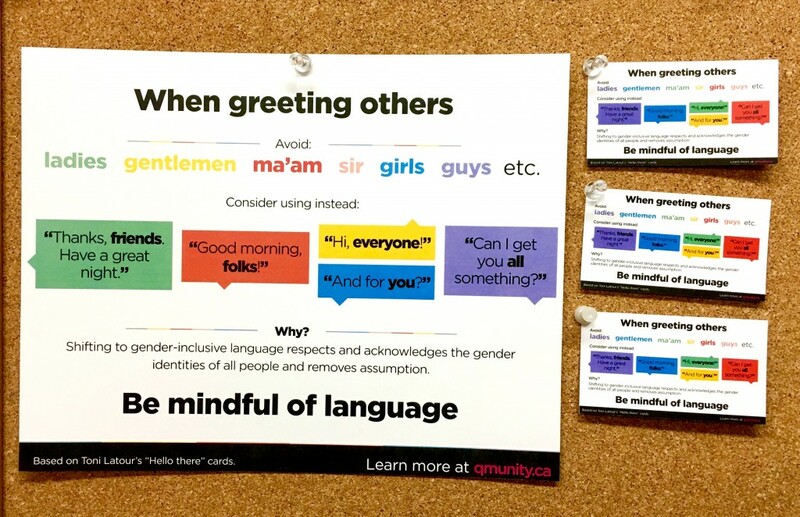 We invite you to download a printable version of the card and to spread the word about the positive impact of using gender-neutral language. UPDATED (Sept, 2016): It is important that we use language that is both inclusive, and affirmative. In some instances, calling a group of women ladies, or a group of men guys, can be gender-affirming. In many instances, we may not know an individual’s gender identity, nor the gender identity of everyone in a group. Be mindful of gendered language that we use. In 2012, Toni Latour, Jenny Lynn, and James Kelly set out to make these cards in response to people being misgendered or “lady’ed” in restaurants. With Toni’s permission, we adapted the original design to encourage and empower everyone to be mindful of language. If the card opens in a new tab in your browser, please right-click the document and “Save As” .PDF. An innovative, youth-driven project for newcomer and refugee LGBTQ youth. This publication aims to promote community engagement, inclusion, and improve settlement services. Moving towards queer and trans competent care for LGBTQ seniors. This discussion paper is a summary of findings and recommendations to provide culturally competent care for LGBTQ seniors in Residential Care and Assisted Living. Healthy relationships take many forms, and healthy conflict can be a part of them. This booklet, co-published with Legal Services Society, is a resource for members of the trans community. It describes relationship abuse, provides tips for staying safer, dispels common myths, and lists community resources where help is available. This booklet, co-published with Legal Services Society, is a resource for the lesbian, gay, trans, bisexual, and queer community. It describes relationship abuse, provides tips for staying safer, dispels common myths, and lists community resources where help is available. A chest health resource for trans folk. Taking care of ourselves and our chests can involve eating well, staying active and getting periodic health check-ups in a setting that feels respectful and caring. It can also mean, whenever we can, surrounding ourselves with people who are inclusive, respectful and loving to us, our gender identities and our bodies. Inclusive language is complex and evolving. We're happy to announce that our most-downloaded resource booklet is also evolving to reflect the way language and terminology has shifted since our last publication date (September 2013). A revised edition will be available by Winter 2017 to assist community members, allies and service providers to use language respectfully.